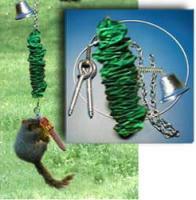 If your anti-squirrel strategy centers on the art of distraction, then this is the accessory for you! 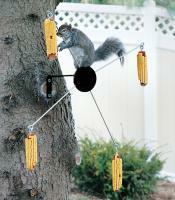 The Squirrel Spinner will provide you with endless laughs and home movie material. Each end of the spinner is outfitted with a cob of dried corn, which is guaranteed to allure your furry foes. As they make their way toward their quarry, their weight will cause the spinner to suddenly tilt and spin! 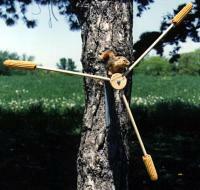 The disoriented squirrel will make an even bigger fool of itself as it makes a futile effort to keep its balance. 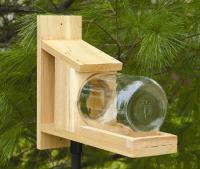 As the Spinner keeps the squirrels busy, your backyard birds can eat in peace. It is great ! My Father-in-law absolutely loved his Christmas gift ! He has it up at his cabin in Big Bear, California. 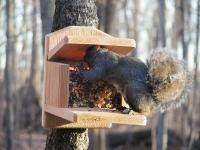 This is an added treat for the squirrels. We can sit at the kitchen table and watch the squirrels go around and around on the feeder. Loads of fun! Great Idea, Really poor execution. The metal spike used to attach corn ears to this fell out in my hand when I took off the first ear. Save your money or donate to a good cause but don't waste it on this item.